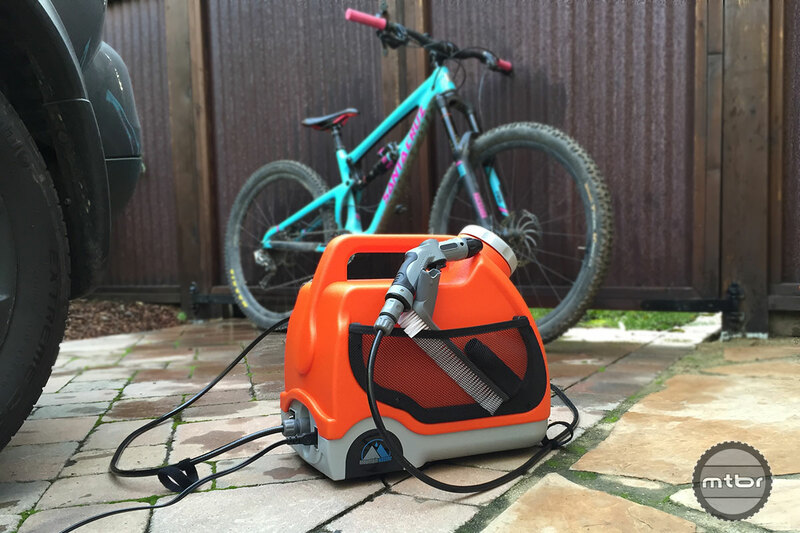 The Mountain washer power washer is a good on-the-go bike cleaning solution, if you need such a thing. The versatile Mountainwasher Portable Power Washer provides consistent, medium-pressure cleaning power when you’re far from a hose bib. It works great for cleaning muddy or dusty mountain bikes when you’re off-the-grid, makes for a sweet cyclocross pit set-up, and doubles as a better camp shower than the “real” ones you find in some legit campgrounds. Its quality construction, 15-liter capacity and versatile hose attachments all help make the case. But before parting with $140, you really have to be sure you’d use it enough. And to make it work, you need to be within 20-25 feet of a car or another 12-volt DC power source, like a marine or portable rechargeable battery. Those last two items add additional cost to the kit. Though the generic instruction booklet that comes with the Mountainwasher give away its origins as a car-washing accessory, we’re not taking any points off for its purveyors’ opportunistic adaptation. The truth is, with its modestly pressurized (40-130 psi) water delivery rate, it’s actually well suited for use on bicycles. It’s strong enough to knock off most mud and muck, but not so powerful that it will easily push water through seals and into bearings—a commonplace occurrence at high-pressure coin-op car washes. With judicious use of the trigger nozzle, followed by a deeper pass using the included power brush head, the Mountainwasher makes quick work of slung-on mud and grime. True, it was easier to clean a bike immediately after riding when things were still fresh, but we found it required only modestly more effort to remove debris we let dry overnight. The caveat being we only tested it with our local soil type, which tends be of medium thickness — somewhere between sand and clay. We imagine thicker, clay-based conditions would require more effort. The Mountainwasher generates a spray pressure that’s good enough to knock off mud, dirt and sand, but not so heavy as to easily contaminate bearings. SPRAY ON-THE-GO – The Mountainwasher is like having a go-anywhere garden hose at your disposal. It takes care of muck and mud, but isn’t so strong as to easily contaminate bearings. The Mountainwasher preps and sets-up simply and easily—just fill the 15-liter capacity reservoir, then attach the quick release hose and a nozzle or brush. Next plug the generously-long power cord into your car’s cigarette lighter port, turn on the unit and pull the trigger. Though you may be tempted to put soap or a solvent in the Mountainwasher, the company advises against it. We ran it water only and found it got rid of everything but that last little film of dirt—something that came off pretty easily when we wiped our bikes with a rag. While we liked the functionality of the Mountainwasher, some might find its need for a nearby car limiting. With a hose length of 20-feet and a power cable that’s 10-feet long, you need to be within 20-25 feet of a vehicle to effectively use the Mountainwasher. This could be remedied by using a portable marine battery or, as we tried, a rechargeable 12-volt DC utility battery. One of our staffers just happened to have such a battery ($30 from Cabella’s) and we added a female cigarette charger receptacle ($8 from Radio Shack) to connect the two. Though we only used this configuration to test the Mountainwasher as a camp shower, we could see it coming in very handy for use in a cyclocross race pit as well. I seriously want one. I don’t own my own place and even if I did I wouldn’t be using the outside hose just to wash my bike as I run the risk (expensive risk) of breaking a pipe due to freezing water. During the winter I ride. It’s rare that during the winter I ever get to ride the trails completely dry which is why I would love to have one of these. Besides spraying a bike after a good long ride is perfect as your body is used to the cold and also warmed up quite a bit. $140? Price is steep for such a basic device. $80 and I’m sold. After Googling other portable bike washers this is actually the cheapest. As most are in the $200 range. 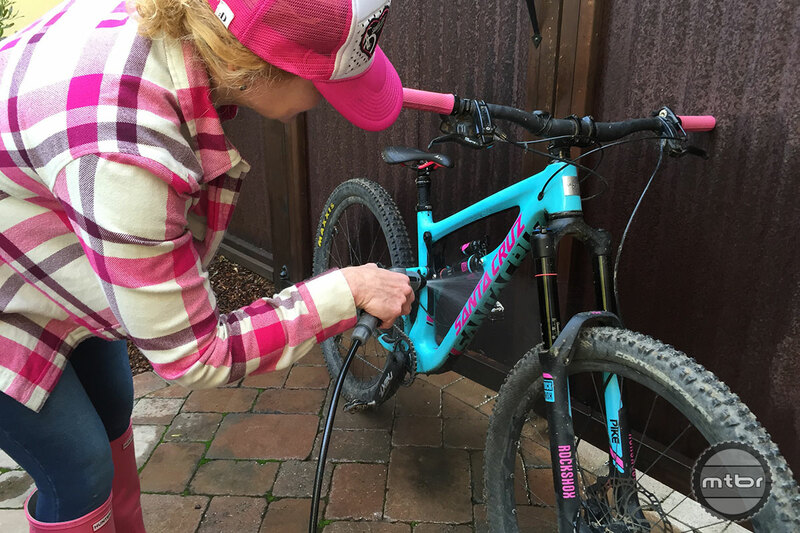 They do offer complete portability via a rechargeable battery but still that’s a lot to spend on a bike wash that may or may not be used often enough during one season. Use a garden pump-style sprayer – like used for liquid fertilizer or pesticides. Maybe $25 at Home Depot. – Does it have a regulate-able trigger on the sprayer, or is it more like a toggle? – Does it come with other power connections besides a 12v ciggy plug? Hey Guys, just a heads up the pricing is in Cdn$ and there’s a discount code available in the checkout. Cheers.